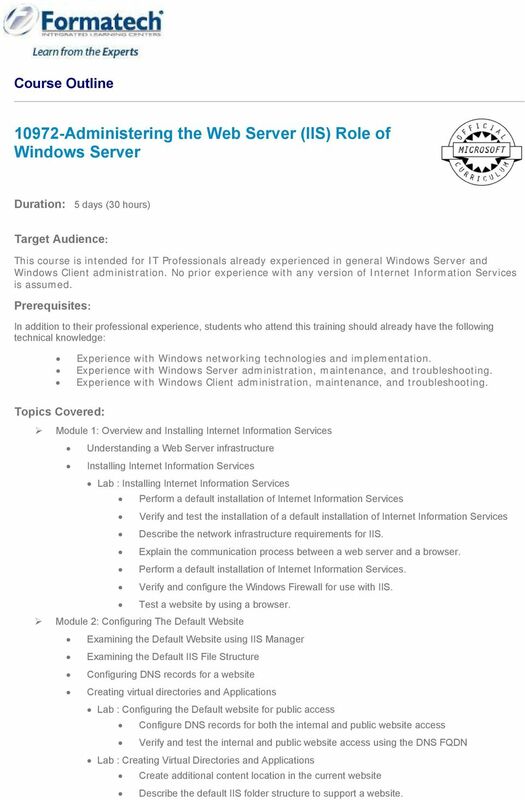 Download "10972-Administering the Web Server (IIS) Role of Windows Server"
1 Course Outline Administering the Web Server (IIS) Role of Windows Server Duration: 5 days (30 hours) Target Audience: This course is intended for IT Professionals already experienced in general Windows Server and Windows Client administration. No prior experience with any version of Internet Information Services is assumed. Prerequisites: In addition to their professional experience, students who attend this training should already have the following technical knowledge: Experience with Windows networking technologies and implementation. Experience with Windows Server administration, maintenance, and troubleshooting. Experience with Windows Client administration, maintenance, and troubleshooting. Topics Covered: Module 1: Overview and Installing Internet Information Services Understanding a Web Server infrastructure Installing Internet Information Services Lab : Installing Internet Information Services Perform a default installation of Internet Information Services Verify and test the installation of a default installation of Internet Information Services Describe the network infrastructure requirements for IIS. Explain the communication process between a web server and a browser. Perform a default installation of Internet Information Services. Verify and configure the Windows Firewall for use with IIS. Test a website by using a browser. Module 2: Configuring The Default Website Examining the Default Website using IIS Manager Examining the Default IIS File Structure Configuring DNS records for a website Creating virtual directories and Applications Lab : Configuring the Default website for public access Configure DNS records for both the internal and public website access Verify and test the internal and public website access using the DNS FQDN Lab : Creating Virtual Directories and Applications Create additional content location in the current website Describe the default IIS folder structure to support a website. 2 Create a web page for site testing and verification. 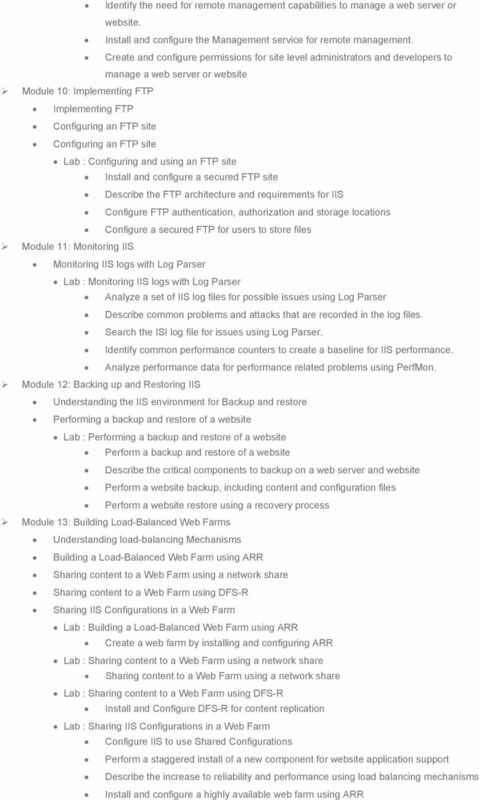 Install additional required Role services to support a web application. Plan the network and DNS records for internal and public website access. Configure DNS records for an internal and public website. Create normal folders, virtual directories and applications in a website for additional content. Verify the new working website and content. 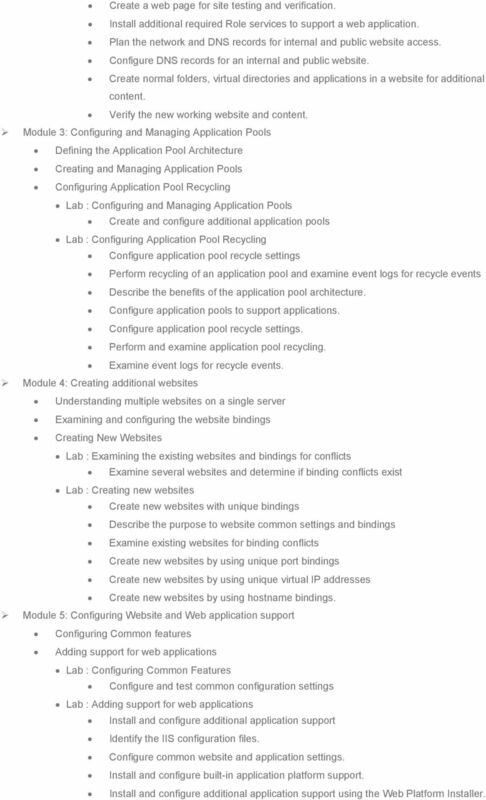 Module 3: Configuring and Managing Application Pools Defining the Application Pool Architecture Creating and Managing Application Pools Configuring Application Pool Recycling Lab : Configuring and Managing Application Pools Create and configure additional application pools Lab : Configuring Application Pool Recycling Configure application pool recycle settings Perform recycling of an application pool and examine event logs for recycle events Describe the benefits of the application pool architecture. Configure application pools to support applications. Configure application pool recycle settings. Perform and examine application pool recycling. Examine event logs for recycle events. Module 4: Creating additional websites Understanding multiple websites on a single server Examining and configuring the website bindings Creating New Websites Lab : Examining the existing websites and bindings for conflicts Examine several websites and determine if binding conflicts exist Lab : Creating new websites Create new websites with unique bindings Describe the purpose to website common settings and bindings Examine existing websites for binding conflicts Create new websites by using unique port bindings Create new websites by using unique virtual IP addresses Create new websites by using hostname bindings. Module 5: Configuring Website and Web application support Configuring Common features Adding support for web applications Lab : Configuring Common Features Configure and test common configuration settings Lab : Adding support for web applications Install and configure additional application support Identify the IIS configuration files. Configure common website and application settings. Install and configure built-in application platform support. Install and configure additional application support using the Web Platform Installer. M10972 Administering the Web Server (IIS) Role of Windows Server Description: This course provides students with the fundamental knowledge and skills to configure and manage Internet Information Services.